Shahin Kazemian has been an absolute standout as a Sales Development Representative at Prezi. After pivoting into sales much later on than most of his colleagues due to hesitations and doubts that sales wasn’t the right route for him, fast-forward 4 months later: now he has found so much success in the sales role and wishes he had started sooner. Even as one of the newest SDRs, he has always surpassed his quota each month, which gave him the reassurance he needed that sales was indeed a good fit. “In my previous role, I lost the passion and magic that makes me motivated to work, but in sales I have found that again. There’s never a dull day. There’s always opportunities to speak to new people and create exciting leads,” said Shahin. To make himself stand out, Shahin is currently working on 2-3 side projects that will translate over into more business leads for him and Prezi. He recently created a Prezi template to show that he can build one, even if he’s not the most creative. This shows clients that if even a sales guy can do it, so can their sales teams. The template he just created is for a friend’s company to use, with hopes that once they use it for a few slide decks, they will see the value in Prezi and want to use it for themselves. 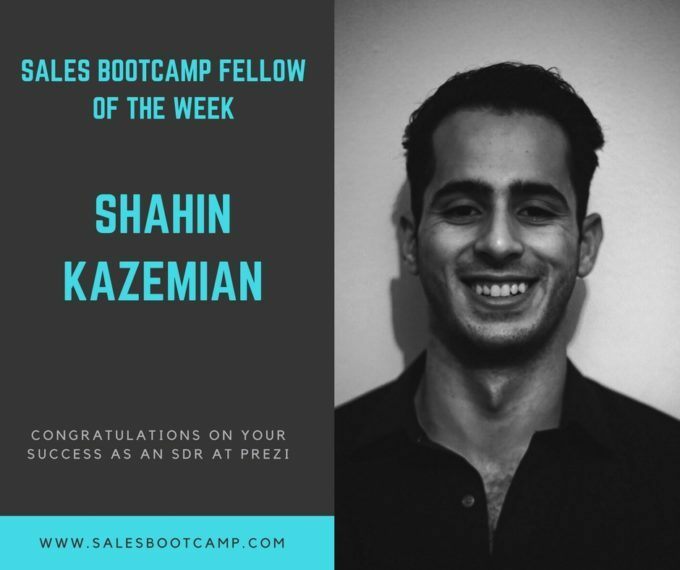 Sales Bootcamp helped Shahin tremendously in the success of his role. He learned a lot of different small skills and trades through our curriculum and fellowship coaches. He was lead through a process, steps, and guidelines on how to properly and successfully perform the SDR role. From his Sales Bootcamp coaches, he learned important tips and tricks to have the best workflow. His biggest takeaway from Ashleigh, our Fellowship Coach, was to have key speaking points on sticky notes in front of him for important details to reference during his calls. He also learned that rather than saying no, he can say, “as it turns out,” or unique phrases so that he’s not being repetitive. He likes to switch up his pitch so that there’s no two months where he feels as though he’s going through a script. “This helps keep the job feel refreshed,” Shahin said. We are so proud of your hard work, Shahin. Keep it up and we look forward to seeing your future success!